Promar senior consultant Lucia Vancura and research analyst Shinichi Kawae completed field research on coffee production in Tanzania and Ethiopia in late 2010 as part of a project for the Japanese Ministry of Agriculture, Forestry and Fisheries. The project looked closely at the coffee industries in both countries in order to identify the issues facing the industries as well as understand their potential role in poverty alleviation and food security. Promar’s conclusions suggest ways that countries or investors can support these coffee industries to increase incomes of producers and expand market opportunities. For both Tanzania and Ethiopia, Japan has long been a major export market, but in recent years, exports to Japan from both countries have dropped, affecting their overall coffee industries. Coffee producers are already vulnerable to coffee price fluctuations, climate change and problems in the coffee marketing systems which make coffee production a difficult path out of poverty. In Tanzania, the volume and quality of coffee production has decreased in the Kilimanjaro Region, the traditional production area for the high quality coffee prized by Japanese buyers. There are several reasons for the decrease. Many farmers have abandoned production as a result of falling coffee prices, and decreasing bean size due to aging coffee trees has also affected quality and production volume. Furthermore, the Tanzanian government is now emphasizing production expansion in the southern part of the country and support for the Kilimanjaro Region is no longer a focus. As a result there is less of the high quality “Kilimanjaro” coffee available to meet Japanese demand. Ethiopian is also a major coffee exporter to Japan, but export volumes dropped from 30,000 tons in 2008 to almost zero in 2009, due to the detection of pesticide residues on beans sent to Japan. The residue exceeded Japanese tolerance levels despite the fact that almost no pesticides are used in Ethiopian coffee production. 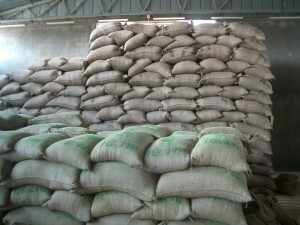 The Ethiopian government maintained that the cause of contamination was the jute bags used for transporting coffee. These bags were often re-used repeatedly, including for the transportation of other crops, which may have resulted in contamination. The Ethiopian government took action by incinerating all jute bags in the country, at considerable expense, and decreeing that only new jute bags stamped with the current year can be used. However, insufficient supply of new jute bags still remains one of several critical problems to be addressed in today’s Ethiopian coffee trade. Promar Consulting’s report on the coffee industries in Ethiopia and Tanzania explores the current situations in coffee production, processing, policy and trade in more detail and discusses how critical issues in the two countries’ coffee industries could be addressed by international donors or private investors. The aim is to facilitate smoother trade and more market opportunities for small scale, impoverished coffee farmers, with the goal of raising household incomes and providing greater security for the lives of those involved in the coffee trade.